The earthy sweetness of roasted winter vegetables complements this piquant dish. Try turnips, rutabaga, sweet potatoes, carrots, and parsnips; garnish with dried apricots. - Spray both sides of duck breasts with non-stick cooking spray; add pepper. - Heat large skillet over medium high heat, add duck and cook 2 to 3 minutes per side or until lightly browned. Remove meat and set aside. - Place apricot nectar, brown sugar, brandy, and cinnamon in pan to deglaze. Bring to a gentle boil. - Mix cornstarch with water to form a slurry. Add to pan and stir. Allow to thicken. - Add sweet potatoes and reduce heat to low. 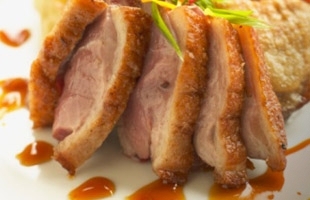 - Add duck breasts and cook 15 to 20 minutes to desired doneness. Potatoes should be tender.